These healthcare teams are part of what’s known as a “multi-disciplinary” approach. 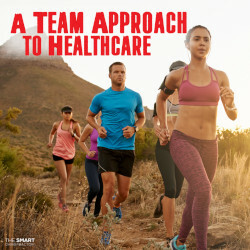 Each healthcare provider focuses on their specialty, and everyone works together to keep the athletes healthy, happy, and playing at their best. Chiropractors are considered an essential part of these teams because of our focus on injury recovery and prevention, and overall performance. Another great benefit of using the team approach is the shift of treatment away from drugs and medication. A high-quality healthcare team can offer you a more personalized path to get well and stay well. (1) Association Between Utilization of Chiropractic Services for Treatment of Low-Back Pain and Use of Prescription Opioids. The Journal of Alternative and Complementary Medicine 2018.